In the race to win Amazon's second headquarters, Seattle's airport tells a story of what some smaller U.S. cities may have to gain from the company's arrival and the up to 50,000 new jobs it's promising. Once a low-key outpost in the corner of the country, Seattle has seen an unprecedented growth spurt fueled in large part by Amazon. Seattle-Tacoma International Airport has been a beneficiary of the boom, rapidly becoming a West Coast power house that's now an alternative to the super-hubs in Los Angeles and San Francisco. Amazon made it clear in its request for proposals that air travel will be critical consideration in its choice of location, which should be no more than 45 minutes from an international airport. "Travel time to an international airport with daily direct flights to Seattle, New York, San Francisco/Bay Area, and Washington, D.C. is also an important consideration," according to the RFP. Air travel is such an important component of Chicago's bid that United Airlines (UAL) Chief Executive Oscar Munoz is part of the city's pitch. Moody's Analytics ranked the top contenders by several key factors, including access to a large airport. Austin, Texas topped the list, followed by Atlanta, Philadelphia, Rochester, N.Y. and Pittsburgh. Should Amazon decide on a larger city like Atlanta or Boston (which ranked 9th according to Moody's) that already have huge airports, adding another 50,000 Amazon employees would be "a drop in the bucket," said Brad DiFiore, managing director of Ailevon Pacific, an aviation consultancy that specializes in air service development. But for smaller communities that are eligible "it's game-changing," he said. If Amazon selects an American city like Pittsburgh or Rochester, "the vote of confidence they've given to that community is a huge economic benefit," he said. Amazon's growth in Seattle, which is also home to Microsoft (MSFT) and Boeing (BA)'s commercial jet manufacturing, has helped turn the city into a major economic power. Seattle's population crossed 700,000 in 2016, according to the the U.S. Census Bureau. That's nearly 100,000 more people than in 2010. The region has swelled to 4 million people. "Technology fueled businesses are driving our population and employment growth. And there's no indication that that's going to abate anytime soon," said Rick Olson director of government relations for the Puget Sound Regional Council. Seattle-Tacoma International airport in May 2017. 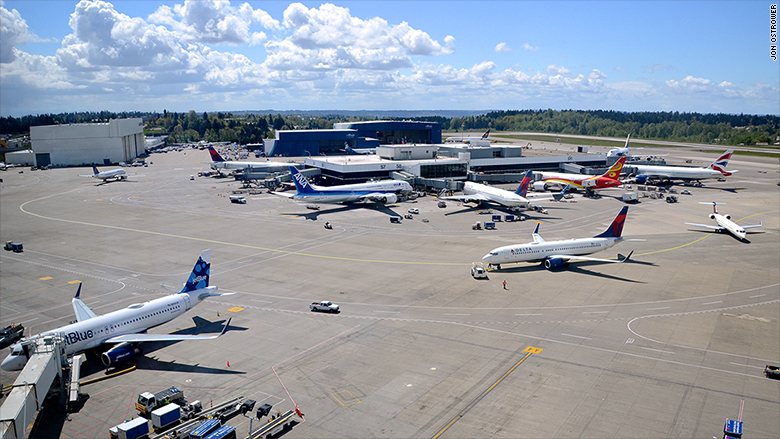 Sea-Tac was the 9th busiest airport in the U.S. last year up four spots from 2015, passing Phoenix, Miami, Orlando and Houston. The number of passengers flying to and through Seattle has grown nearly 40% since 2011, with 45.7 million people coming through last year. It's landed 11 new international airlines and 16 new intercontinental destinations, including Beijing, Shanghai, Shenzhen. 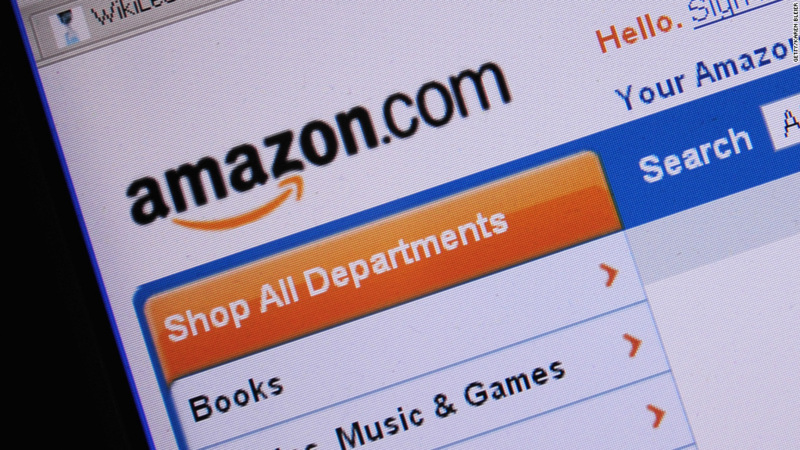 In 2016, Boeing, Microsoft and Amazon (AMZN) (9th, 12th and 19th respectively) were among the top 20 the largest buyers of corporate travel in the U.S. Five years ago, Amazon didn't even crack the top 100, according to Business Traveler News. The company spent an estimated $216 million on air travel last year. The growth has spurred a fierce battle between hometown Alaska Airlines (ALK) and Delta Air Lines, (DAL)which in 2012 made Seattle a hub. Situated ten hours from Asia and ten from Europe, Seattle is prime real estate. And with the incredible influx of new Seattleites, Alaska and Delta are vying for the business of the newcomers. It's not just passenger tickets, Amazon has expanded its own branded cargo operations at the airport as it looks to fly more of its shipments itself. But the growth has a downside, as the swelling population has driven up real estate prices, snarled traffic and left Sea-Tac busting at the seams. The airport's 1970s-era international terminal is straining under the weight of more than 1,900 international passengers every hour at peak times. It was only designed for 1,200 every hour. The airport is embarking on a $1.5 billion effort to increase capacity and will also completely revamp its north terminal, adding eight more gates. In August, the airport officially broke ground on an expanded international arrivals facility, which will include a 900 foot-long skyway bridge will connect the international terminal to the expanded arrivals area. At 85 feet tall, a Boeing 747 will be able to taxi underneath the bridge. As part of the project eight gates at the revised terminal will be converted to handle arriving international passengers who need to clear customs. The incredible expansion in Seattle is straining all forms of transportation, says Olson. That has airlines are looking for overflow space. Alaska Airlines plans to start flying out of a new passenger terminal at Paine Field in Everett, Washington, about 35 minutes north of downtown, in 2018. Alaska estimated the new service could shave as much as 80 minutes off of airport commutes during peak times, according to publicly available traffic data. Sea-Tac is still by far the dominant airport, but "we're going to learn a lot from what happens with" the new terminal, said Olson.